TRANSPORTATION POLICY * We only ship our animals within Canada* Things you need to know regarding all transportation whether it is delivery by courier or by Air! We prefer that our animals be picked up at our home in Niagara Falls, ON by the purchaser, however we know that this is not always possible. Transportation can sometimes be arranged via a private ground courier or by air. We can usually help with making the necessary arrangements to transport your pet but these transportation costs are not included in the purchase price of the pet. Transportation costs are a separate purchase and all the costs associated with transportation are solely the responsibility of the purchaser and these charges are non-refundable. 	You certify that you the purchaser are at least 18 years of age or that you are the legal guardian or a person who is at least 18 years of age who is making this purchase. (Identification may be required at the time of delivery) 	We offer a Health Guarantee with all our animals. Shipping is a separate purchase therefore along with our Health Guarantee we guarantee live arrival of the animal being delivered. The purchaser assumes all responsibility for all transportation fees and understands that they are considered as a separate purchase; which are not covered under our Health Guarantee, they are refundable and not transferrable! 	Not all animals are eligible for shipping / transport. (this is at our discretion) We require that the total purchase of $200.00 (not including transportation fees) be made per transaction. (Multiple animals can be purchased at the same time to make up the $200.00) 	Transportation is often available via a third-party courier. The courier is usually not able to answer questions, pertaining to the pet that you are purchasing. 	NO C.O.D. …No Animal leaves our home unless it has been paid for in full (including transport fees) at least 24 hours prior to the delivery date. Whenever possible we encourage new pet owners to pick up their new pet in person! If someone has given a lot of thought to getting a new pet from us but doesn’t drive we may be able to arrange to have a new pet delivered by an independent courier. We have been using the same couriers since 2010 and so far everything has been excellent and the prices are reasonable. We currently only have access to two couriers that are familiar with exotic pets who regularly deliver London, Guelph, Kitchener, Waterloo, Cambridge, Hamilton Niagara and much of the GTA. These couriers deliver during the daytime and through early evening, Monday through Friday. (Weekend delivery may also be an option for those living in the Niagara area). The couriers will not meet anywhere other than the actual home address, as it appears on our Health Guarantee. Delivery dates can vary weekly, depending on the time of year. Delivery fees are at the purchaser’s expense. They are a separate purchase and are not included in the purchase price of a pet from heritage-pets. The delivery charges are non-negotiable and non-refundable. The fees do vary slightly; depending on current gas prices. To purchase a pet from us you must be 18 years of age or have someone willing to sign on your behalf that is at least 18 years of age. If you are interested in having a pet delivered we will need to know when you would like it to be delivered (day of week and approximate time of day) and we will need your address (street name, city and postal code). Once we receive that information we will contact a courier to find out what the delivery fees are and we will ask about the next date that delivery is available in your area. All delivery fees plus 25% of the purchase price of the pet must be paid in full at the time of booking. Then the entire purchase including the delivery fee must be paid in full at least 48 hours prior to delivery/shipping date. I.D. may be required at time of delivery. We at heritage-pets.com have shipped live animals to all major destinations within Canada since 1986. We have found that it causes the least amount of stress to the animal and it is the most reliable, the fastest and most economical way to get one of our animals across the country to your home in a matter of only a few hours. We use West Jet or Air Canada, both fly to most major cities within Canada. The cost per shipping carrier, to the purchaser (excluding the price of the pets) is $179.95 within Canada. This includes; delivery by private courier to the YYZ (Toronto) airport, an airline approved carrier and the cost of the flight. If you are considering having one of our animals shipped to you, please read and follow the steps as indicated below. You certify that you are at least 18 years of age and that that you understand that shipping fees are not a part of the purchase from heritage-pets.com. They are considered as a separate purchase and they are not refundable! The ideal delivery date and whenever possible at least one alternate date and time(s) that you would prefer. .
As per your specifications, we will do our best to select the appropriate flight for you. We will check to see if there is a flight available for the date and time that you specified and we will verify that the private courier that we usually hire is available to pick up the pet from our home and deliver it to Toronto YYZ airport on time. Once we have confirmed everything we will contact you to see if everything is acceptable to you. If yes, we will ask for your contact information to book a flight…(this includes your first and last name, ship to address including postal code and contact phone number and email address). We will also request payment in full for the shipping fees plus 25% (minimum) of the actual cost of the animal(s) being shipped. It is important to understand that once a flight has been booked all shipping fees and associated charges are not refundable and they are non-transferable. This means that once a flight is booked, the date and time can not be changed. If for any reason you need to cancel or make changes to your original flight you will loose the shipping charges and you will be required to re-book and pay the cost of the shipping all over again. After we receive the shipping amount and the deposit for the animal we will consider the animal (s) sold and we will go ahead and book the flight and send you a confirmation number (Airway Bill #) and a receipt of payment by email. We will prepare the animal for shipping in an airline-approved carrier in accordance to the airline’s specific Live Cargo Guidelines. We will call or email you once the animal has been processed by airport security. Call your local airline to check to be sure that your flight is on time. Show up on time at the airport with the Airway bill # and proper photo identification. Once you have received your pet be sure to check it over to see that he or she seems okay. If everything is okay you will be asked to sign and show your ID to accept it. If it is windy or cooler than 20 degrees I suggest using something warm to cover your pet during the walk from the airport to your car. Why not have a blanket with you just in case! Keep the animal(s) warm and comfortable on the drive home. If it is cool outside make sure the air temperature in the vehicle is at least 20 degrees or slightly warmer but never put the animal in front of the car heater. It will over heat! Once you and your pet are settled in at home, send us off a quick email or phone us to let us know that your pet has arrived safely. We do not ship to the USA but many Americans purchase our pets. People coming from the USA who are interested in purchasing a pet from us are certainly welcome to call to schedule a visit at our home, to view any animal that is posted for sale on our website. We live in Niagara Falls, Ontario, only 4 or 5 minutes to the closest border crossing. 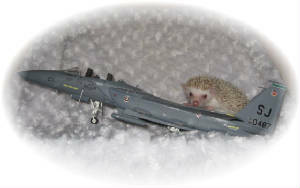 Hedgehogs entering the USA do require inspection. When crossing at Lewiston Bridge they will request that you fill out a form and then ask you to go to the USDA inspection site located on Whitmer Road.